Many businesses ask us to recommend the best way to design a solar power system to meet their electricity needs. Others have received solar PV proposals, and want to evaluate the effect the proposed system will have on their total electricity consumption and costs. 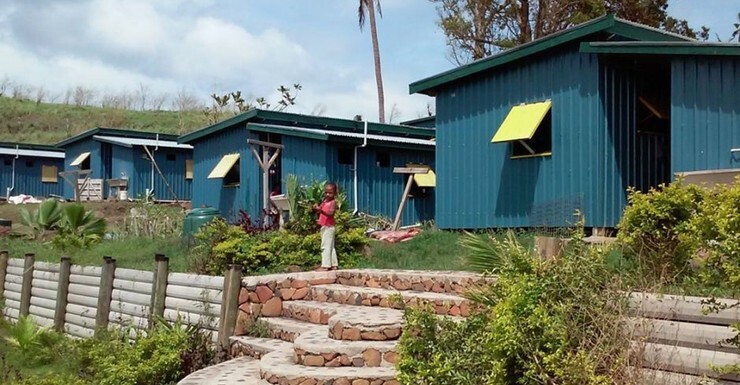 Some proposals simply propose the largest system which will fit on the roof, or the largest system which will qualify for ‘small technology certificates’ (STCs). What’s really needed is a holistic system and investment optimisation. So we have produced this quick guide to the main things you should consider when you specify a solar power PV system for your business premises. Invest up to $20,000 n renewable energy and energy efficiency equipment, in the next five months, to get a 100% tax deduction. Introduced in the 2015 Commonwealth budget and retained in the 2016 budget, is an immediate tax deduction for small businesses for every asset purchased costing less than $20,000, ending in June 2017. So energy efficiency improvements, each costing under $20,000 will be able to be expensed, for tax purposes. And many energy efficiency projects in small business typically require less than $20,000 or less than $20,000 per asset. For example, it could include a $15,000 lighting upgrade, a $10,000 controls upgrade, and a $10,000 investment in insulation. Similarly, an investment of $20,000 in renewable energy could buy a 15 kW solar power system or a 3 – 5 kW wind turbine (costs net of renewable energy certificates). ‘Small business’ isdefined as a business with a turnover of under $M2 / year. To discuss this opportunity to invest in reducing your organisation’s energy costs (tax effectively) please phone Genesis Now. 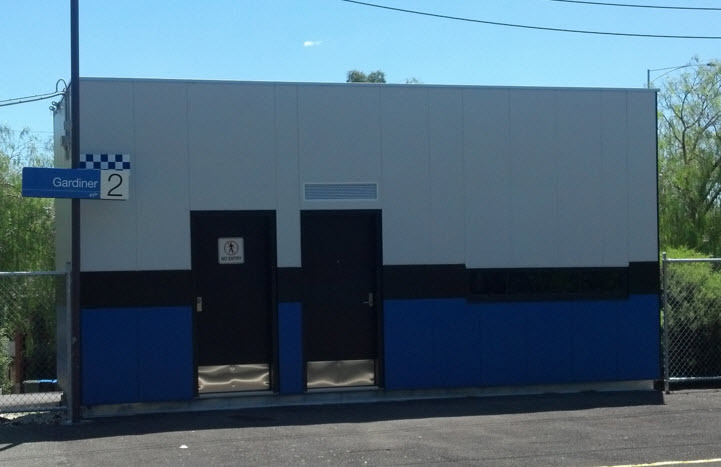 Modular building should be the natural choice for Australian homes, both new build and renovations. Off-site or factory-built components (whether ‘volumetric’ modules or flat-pack panels) should be cheaper, quicker, higher quality, and provide more design flexibility. On-site labour can easily cost 4 times factory labour rates, despite being able to get less done because on-site work is limited to relatively small tools. Building sites in Australia are geographically dispersed, adding to travel costs for workers and their tools. Off-cuts are much harder to use on-site than in a factory, adding to materials costs (and waste disposal costs). You wouldn’t buy a car from a company that said it was going to build it in your backyard, (and you certainly wouldn’t be able to buy it for under $20/kg. So why buy a house that way? You might think this shelter for security staff is a modular building, but it was built on site. At least when it had to be relocated for a railway station works, it was moved as a module. However, modular construction has achieved only a tiny slice of the home construction market, despite some of the earliest buildings post-1788 being made from kits imported from the UK (almost by necessity). . Why has the car industry progressed so far in 130 years, yet many home building practices date from over 2,000 years ago? factory construction will be at an economic disadvantage compared with the low-capital on-site construction, until production volumes savings off-set that capital investment. This is largely a chicken-and-egg problem. a lack of interoperability standards between modular building companies, means each must produce all it’s components, and so bear the capital investment of all tooling etc. This compounds the chicken-and-egg problem above. a customer perception that modular means design inflexibility, and all houses looking the same (but modern design and manufacturing methods should increase customer choice). a lack of systems, standards and software integrating home buyer requirements with building design and manufacturing. Geoff Andrews is Engineering Manager, and MD at Genesis Now, and former Engineering Director (and co-founder) of ESD Consultancy Ark Resources. There is a lot of buzz and talk in Australia about solar PV owners losing attractive feed-in tariffs (25 to 60 cents / kWh) and falling back to take-it-or-leave it offers from electricity network monopolies of around 6 cents / kWh. This in turn has led to talk of installing batteries, to store the excess electricity on site, for use later. We have started a Twitter poll, here. Perhaps it’s not the greenness of the solution which interests you, but fairness, or something else. That will be canvassed in a later poll. 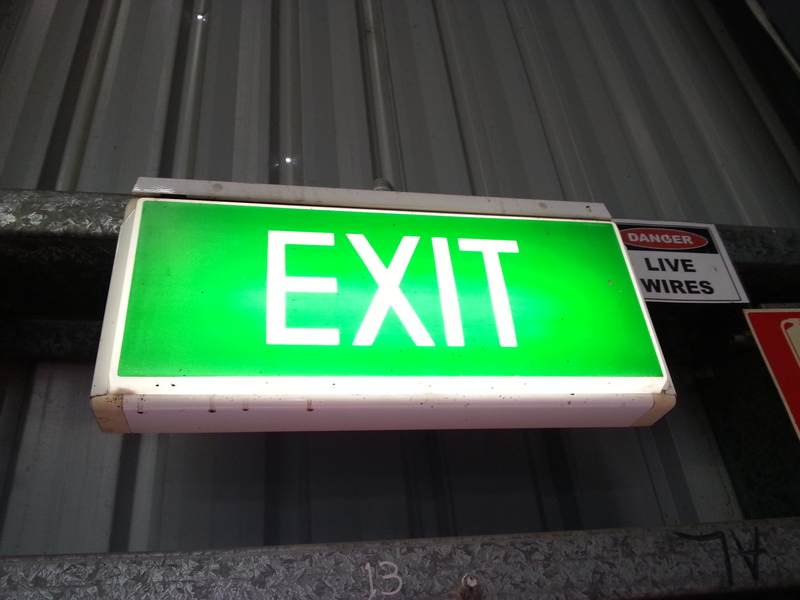 Grants to help Victorian SMEs identify energy and materials efficiency opportunities. Small to medium enterprises (20 – 200 staff) are eligible for 50% subsidy for energy efficiency and materials efficiency investigations, but applications close 31 March 2016 for energy assessments, and in May for materials assessments. Genesis Now completed very successful materials and energy efficiency assessments under the earlier Sustainability Victoria program: Smarter Resources Smarter Business, identifying many savings opportunities and achieving a very high implementation rate. We conducted resource efficiency investigations in Melbourne and regional Victoria (as far afield as Mallacoota), in a wide range of industries, including: manufacturing, food processing, hospitality, agriculture / animal husbandry, industrial services, wine, cabinet making, timber milling, and housing construction (including module manufacture). Further information is available on the Sustainability Victoria web site, or just phone us to discuss. Having completed over 2,500 projects, we might even be familiar with some of the processes in your business. If you operate a medium to large business in Victoria, Australia, chances are that ‘Critical Peak Demand Day’ charges will account for a large part of your annual electricity cost. Most managers focus on the ‘retail’ component, but the Critical Peak Demand charge (which almost nobody is aware of) can account for about the same amount. Have a look at this example. In the 2015-16 Summer, Victoria has only had a few hot (over 40°C days), and these were during the holiday period, so fewer businesses were running. AusNet, the operator of the electricity distribution network in the Eastern half of Victoria, is in a bit of a bind. It has until the end of March 2016 to declare up to four critical peak demand days. The higher the demand on those days, the more revenue AusNet will receive, so it should aim for the hottest days. But there are no really hot days forecast, and the longer Ausnet leaves it, the cooler the weather is likely to become. So it will be interesting to see what Ausnet decides to do. Monday 22 February (forecast 30°C) has been declared a Critical Peak Demand Day and Tuesday (forecast 35°C) will almost certainly be declared a CPDD. Take action to reduce your electricity costs for a whole year. Reducing electrical power demand between 3 p.m. and 7 p.m. (daylight saving time) will help to reduce the CPDD charge for a whole year, for electricity customers on one of the following network tariffs: NSP56, NSP75, NSP76, NSP77, NSP78, NSP81, NSP82, NSP83, NSP91, NSP94 and NSP95. (check the back of your electricity invoice). The Critical Peak Demand charge typically accounts for about 15% industrial customers’ total electricity cost. So reducing demand for 4 hours, can result in significant savings. If you would like to discuss ways of reducing critical peak demand, the capacity charge, and other electricity costs, please phone us to discuss. In October 2013 Genesis Now wrote about Victoria network providers moving from demand charges based on real power (kW) to apparent power (kVA) for large energy users (here’s the link). At that time, Ausnet and United Energy had made the switch; Citipower / Powercor will do so from 1st July 2016 and Jemena from 1st January 2017. This means that businesses will be charged not only for the actual real power used but for the overall power used to deliver this, which includes reactive power (kVAr). Due to this change in tariff structure, reducing demand cost requires not only reducing real power but also reducing the reactive power. In order to reduce reactive power businesses need to improve the ‘power factor’. This can be achieved by installing power factor correction devices on individual items of equipment or at the main switchboard. However, replacing inefficient plant equipment or lighting can improve power factor and also reduce demand. 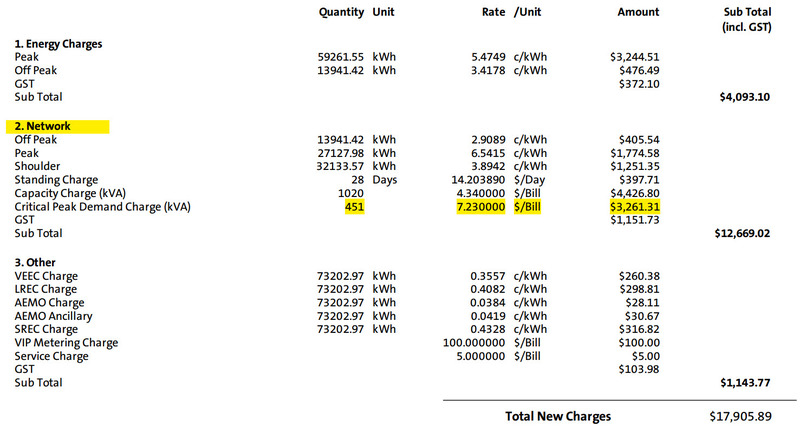 For example, if present demand is 200 kW and power factor is 0.7, the associated apparent power is 285 kVA. Improving power factor to 0.98 would reduce apparent power to 204 kVA, a reduction of 81 kVA or 28%. However reducing demand instead to 143kW would also reduce apparent power to 204 kVA with no change in original power factor. Thus it is important to assess both energy efficiency (demand reduction) opportunities and power factor correction actions in order to determine the most cost effective solutions. Both of these actions would also increase existing capacity meaning that extra equipment could be operated simultaneously or that additional equipment could be installed without the need to undertake costly and disruptive upgrading of electrical infrastructure (e.g. customer transformers, wiring, switchboards). If you would like to reduce both your electricity demand and improve your power factor, Genesis Now is here to assist you. Real power: makes loads, such as motors and lighting, operate. Reactive Power: enables the real power to circulate within inductive loads such as motors. Apparent power: combination of both real and reactive power. Power Factor: a measure between 0 and 1 of the proportion of real compared to apparent power. A power factor of 1 means that all the energy supplied is able to be converted into real power meaning it is fully utilised. I certainly wasn’t expecting to be spending time on Saturday, blogging about Origin Energy’s apparent tendency to invoice customers for gas they haven’t supplied. Aaargh! In Sep 2013 I wrote a post on the frustration caused by incorrect electricity and natural gas invoices, which somehow always err on the high side. Particularly frustrating was not only that the professional meter readers could not transcribe a four digit number from the gas meter to their mobile device, but that the device software had not warned that the reading figure appeared wrong. A further problem was that Origin Energy refused to accept photographic evidence that the meter reading was wrong. The complete waste of time spent on the phone added insult to injury. One of the examples in that post was a blatantly wrong gas meter reading and resultant gas invoice (Origin Energy was the retailer) for our own office building. Fixing that invoice was a protracted, frustrating and time-wasting exercise, especially as we had vacated the building. Move forward to 2016 and I receive a natural gas invoice from Origin Energy for my own home. I was actually looking forward to this invoice because I had received several ‘estimated’ invoices which had overestimated consumption (of course) to such an extent that on the 10th November invoice I had paid for more gas than had been used by 7th January. So I was expecting a credit. Origin had sent an SMS asking that the gate be left unlocked for 3 days so the meter could be read, so we left it open and were expecting an invoice. When it arrived this morning, I was so confident that it would be in credit, it took me several minutes to realise that I had received an invoice for $1,780.18. So let’s look at an extract from the invoice and a photo I took of the meter. The (A) indicates that this is an actual reading. Clearly this is nonsense. The same meter number can be seen in both the invoice extract and the photo ( 7763IC). The meter reader has made a mistake. OK, humans make mistakes, but if one of Multinet’s main roles is to read meters, it should be able to do that. 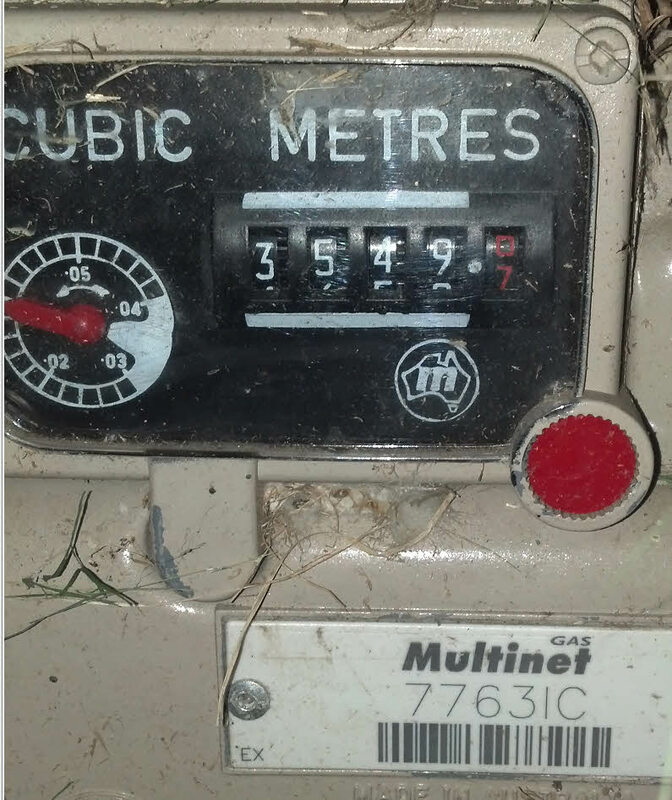 The incorrect meter reading has not been caught by the data collection system (the calculated Summer consumption was twenty times the consumption of the last actual meter reading in July!). The system (if there is one) should have prompted the meter reader to check the reading. Many people who receive an incorrect overcharge like this would assume that an organisation the size of Origin Energy would be competent enough to be able to accurately bill their customers, and would pay the bill. And if it’s a final bill for that account, they are unlikely to see their money again. With automatic debiting of bank accounts, an error like this one could easily empty a personal bank account, causing problems with everyday living expenses. When I informed Origin Energy of the billing error, they were unable to accept a photograph of the meter as evidence of the error. Further, they couldn’t give a definite time that the meter could be read. There was no offer to hold off debiting my account while the invoice was in dispute. In 2008 The Sydney Morning Herald reported on ‘billing bungles’ , citing Origin Energy and AGL as the ‘main culprits‘. In 2012, The Advertiser reported ‘No end in sight for Origin customers’. Whirlpool forums have many stories of Origin Energy billing problems, such as ‘Origin – very dodgy bill received‘ from 2011. How about this heart-breaking tale from 2011, which illustrates frustration and anger I empathise with. Social media monitor Service Rage has classified Origin Energy posts as 96% negative and 4% positive, with billing errors a prominent theme. This resulted in the 3rd worst rating of all energy companies. Origin Energy earned a rating of 1.3 stars with 89% of 597 customers on Product Review, classifying Origin Energy as ‘Terrible’ (accessed 16 Jan 2016). I could go on, but you probably get the idea by now, and Google has plenty more if your blood pressure can stand more examples. Deliberately deceptive invoices from companies in (e.g.) Nigeria, Russia, Eastern Europe are commonplace, and almost amusing. But we shouldn’t have to endure systemic overbilling for a decade, from a billion dollar publicly listed Australian company. Is the Executive asleep at the wheel? Does the Board of Origin Energy care about customers and the community? Do they oversee the systems in place or even look at social media? How can billing errors be so prevalent for so long. At best, this looks like negligence, and perhaps deliberating ignoring the problem. And if Origin Energy must rely on the accuracy of meter readings from others (e.g. Multinet), ask them to get their house in order. Really look into your billing systems performance and customer satisfaction, and take urgent corrective action. Fix my problem (if you care, my case reference number is 708 779 3603). By the way, your call centre operator was very patient; I don’t know how they manage to deal with the frustration caused in other parts of the organisation, every working day. Thanks R.
(with Multinet and other network service providers), implement error catching software in the meter readers mobile devices. Implement error detection systems in your billing engine. Automatically suspend bank debits of accounts in dispute. Check your energy bills. Don’t assume that the invoice is correct. Take a photo of your meter, especially if you are moving home. Choose retailers carefully. Do your research. It’s not all about what you see in advertisements or comparison sites which don’t compare all retailers. At some stage you will need to deal with customer service, and you as a customer will want service. Consider getting off natural gas all together. It will be one less energy retailer to deal with. Do Not give energy retailers automatic bank debit authorisation, or you could get a nasty shock at the supermaket checkout, and be asking friends for food. I know this has happened. This is a hard one. If the regulators haven’t fixed the problem of misleading and deceptive billing and poor customer service, despite the volume of evidence that there is a problem, I don’t know what to recommend. The Victorian Energy Efficiency Target (VEET) is a Victorian Government mechanism designed to assist energy users with the cost of investing in efficient technology upgrades. VEET was introduced in 2009, and has been particularly active in the residential sector. In Q1 2012 the VEET scheme was extended to apply to industrial and commercial lighting, under Schedule 34 of the VEET Act. Unfortunately, VEET has mainly been active in the sense of charging a levy on the electricity use of all commercial and industrial businesses, (other than a relatively few businesses which were on the Vic EPA ERP register, and this is likely to be reversed in the next few months). Over this period, there has been relatively low activity levels in commercial lighting upgrades in Victoria, which is in stark contract with the NSW Energy Saving Scheme, which has been predominantly active in commercial and industrial lighting, with almost no residential activity. This means that businesses (probably including your business) have been paying a levy since Q1 2012 and receiving nothing in return. So what to do? Genesis Now is active in implementing lighting retrofits under VEET Schedule 34. 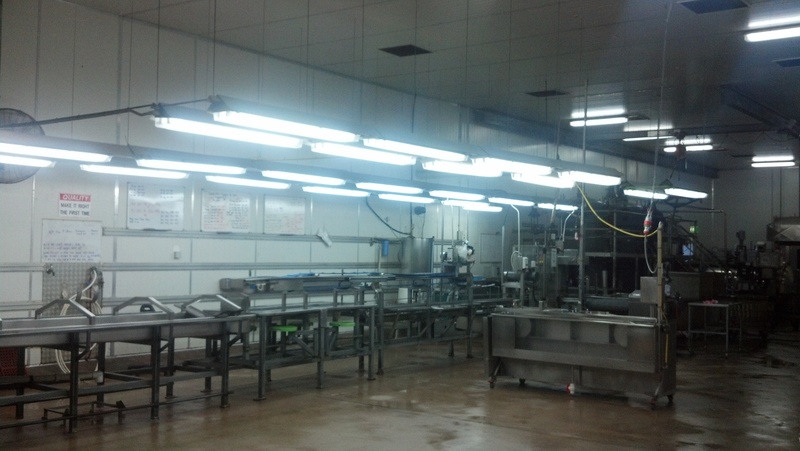 Give Genesis Now a call and we will structure a lighting upgrade which is fully VEET compliant. The VEET benefit can result in 30-60% reduction in cost, ensures all equipment is meeting the latest standards and ensures all lighting equipment containing the dangerous neurotoxin Mercury is safely removed and recycled. The combined benefits of the VEET cash rebate and ongoing electricity savings can result in a can payback period of one year. Talk to us about green financing options and the option of a financed project with a cash VEET rebate. We also design lighting efficiency project to achieve significant co-benefits such as improved colour rendition, improved comfort, the end of strobing or flickering lights and where “smart” lights are specified, the end of the need to manage lighting using switches, as the lighting becomes fully automatic. 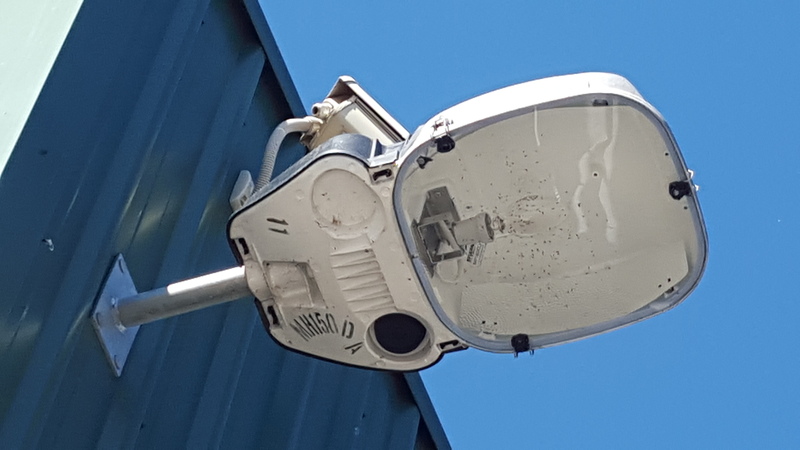 Automatic ;smart’ lighting generates additional VEET benefit compared to standard ‘dumb’ lighting; and in most cases we have reviewed provides a better business case compared to dumb lighting. Genesis Now has long understood that automation is the key to optimising energy saving and lighting is no different to other energy services in this respect. We take automation and sensors for granted in many aspects of our lives, for example automatic doors, cruise control and the like. Smart lighting systems utilise on-board sensor and logic to control lighting output. For example, daylight harvesting systems can react to daylight infusion into a space by progressively dimming lights accordingly. Occupancy controls can react by gently dimming lighting after they have detected no movement in spaces for a (programmable) period. Another smart feature, trimming lighting levels on installation, can make sure the correct brightness is achieved for the space’s requirements and not too much, as lighting which is too bright can case discomfort as well as wasting energy. In industrial and commercial retrofits (e.g. offices, factories, workshops, warehouses) we can achieve up to 90% energy saving compared to existing lighting. Typically dumb lighting retrofits only achieve around 50% energy saving. Our engineers can find it disappointing walking into an low occupancy warehouse, mixed use space or office and finding efficient LED lights burning, but little else going on. The job of replacing old inefficient lighting has been done, but it has been done less effectively than it should have been; and it can now be too expensive to reinvest and do it right. for no cost or obligation please contact us. Genesis Now is happy to welcome Environmental Engineer, Marty Robinson to our multi-disciplinary team. 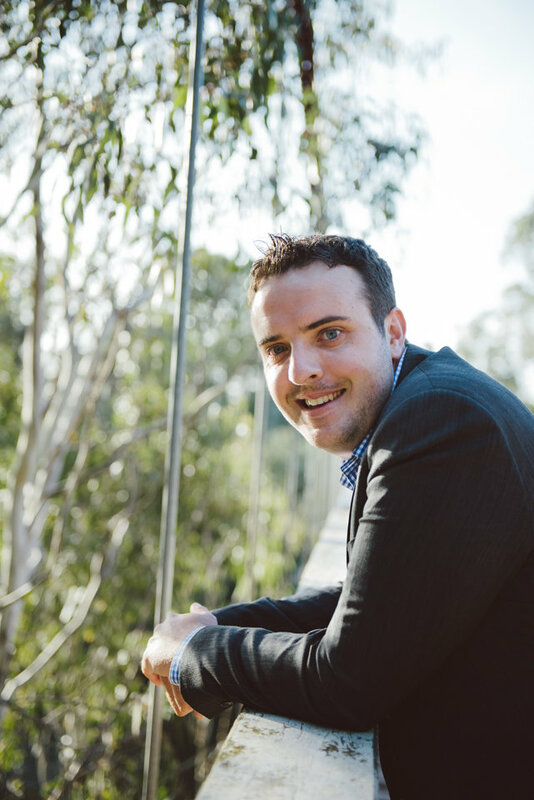 Marty is a recent environmental engineering graduate from RMIT University where he obtained first class honours, specialising in water/wastewater engineering. His work placement was completed as a combination of local rural council and urban energy efficiency consulting. He is passionate about transforming the sustainability of business and industry within Victoria. Raised in a country town in Northern NSW and educated in metropolitan Melbourne, Marty has a balanced perspective of community attitudes and respective challenges towards sustainability. In his spare time he enjoys the outdoors, his church community, postgraduate study in sustainability and competitive lawn bowling. We are excited at the prospect of the wider range of client benefits which Genesis Now is now able to provde to our clients.